I was recently at Speke Hall, a Tudor house near Liverpool. In an upstairs room, you can see where a priest hole has been built into the fabric of the building to make it invisible to anyone who did not know it was there. It is of an ingenious design and is just one of many to be found in Catholic houses across England where priests were able to hide to escape arrest during the years following the Reformation. ‘Little John’. Owen was born in Oxford in 1562, one of four sons of Walter Owen who was a carpenter. His brother John was a priest, his brother Walter died in 1591 and third brother, Henry, was apprenticed to a printer and engaged in the secret printing of Catholic literature. In 1577, Nicholas Owen was apprenticed to the Oxford joiner William Conway and learned the skills that he later put to use designing and building secret hiding places. By 1588, he was in the employment of the Jesuit priest, Father Henry Garnet and later became a Jesuit lay brother. 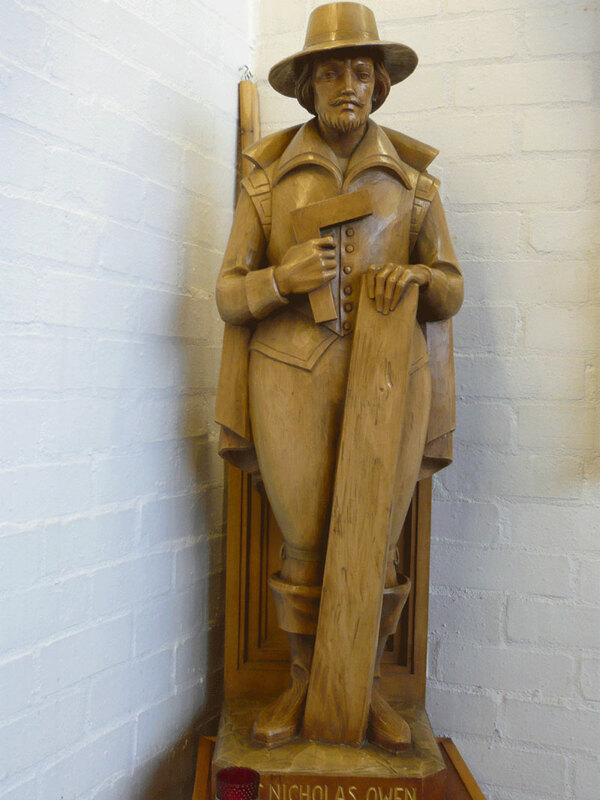 He travelled from house to house, accepting only a bed and food as reward for his work and in a letter dated 1596, Father Garnet speaks of ‘a carpenter of singular faithfulness and skill who has travelled through almost the entire kingdom and, without charge, has made for Catholic priests hiding places where they might shelter the fury of heretical searchers’. His nickname was ‘Little John’ as he is reputed to have been very small. He walked with a limp after his leg was badly set following a fracture when a horse fell on him. He also had a hernia, but none of this prevented him from working alone and in secret, usually during the night, to break down stone walls and reconstruct them in such a way as to create secret places that were almost impossible to find if you did not know where to look. He made false entrances in fireplaces and staircases, trap doors, sliding doors and in the case of Speke Hall a crawl space above a ceiling accessed by a rope ladder in a small space at the side of a bedroom. He is said to have favoured sites away from outside walls and had the ability to think in three dimensions and in curves. He used false perspectives and illusion, now more often employed by stage magicians, to hide the priest holes, many of which have since been discovered, although it is possible that there are still more waiting to be found. 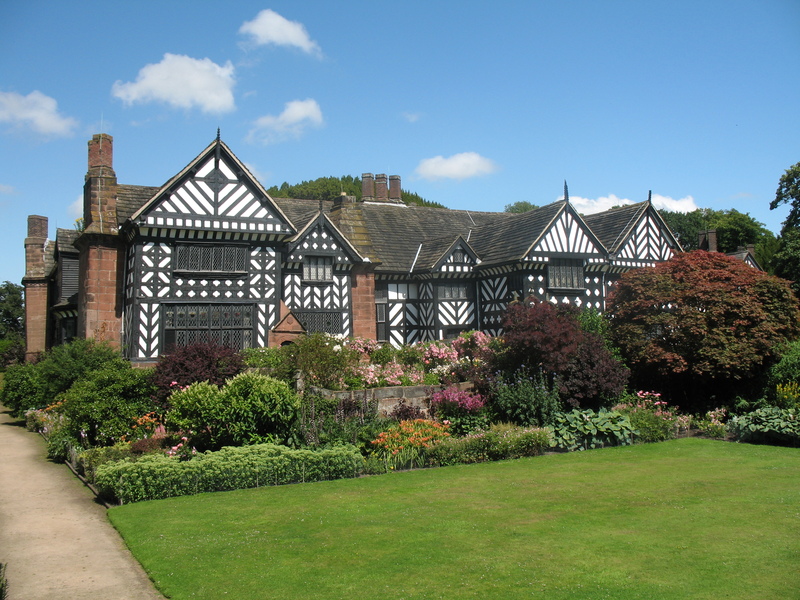 The guide at Speke Hall told visitors that the owners of one Elizabethan manor house uncovered a priest hole, complete with priest, during renovations. At Hoghton Tower, also in Lancashire, one priest hole was only discovered when an electrician fell into it, and at Astley Hall in Chorley a priest hole was discover as recently as 2004. When the search parties arrived at the houses of suspected Catholics, perhaps tipped off by suspicious neighbours, they brought with them their own carpenters and masons to help in the search. Measurements were taken to try to find spaces not accounted for by the length of the wall or height of the ceiling and if anything didn’t seem quite right panelling would be pulled down, floors taken up and swords thrust into any gaps that might conceal a priest. These searches could go on for days, even weeks, and all the time the priest in his hidden chamber had to remain still and silent faced with either discovery or starvation. Some priests were discovered and arrested, but many more escaped detection and ‘Little John’ is remembered by modern Catholics for saving many lives. Nicholas Owen is also credited with engineering the escape of Father John Gerard from the Tower of London by means of a rope strung across the moat, but, sadly, there was no escape for Owen himself after he was arrested at Hindlip Hall in Worcestershire in the aftermath of the Gunpowder Plot in the reign of James I. The house was surrounded by 100 men at daybreak on Monday, 20th November and the searchers began to rip the house apart. Nicholas Owen and another man seem to have allowed themselves to be discovered creeping along a gallery, possibly to detract attention from the two priests, Father Garnet and Father Oldcorne, who were also in hiding there. But after eight days, the priests were found and also arrested. tortured following Cecil’s instructions that ‘the secret is to be wrung from him’. He was first manacled by the wrists and suspending in chains from a ceiling. This resulted in his hernia bulging from his body to such an extent that his intestines were protruding, so the tortures strapped an iron plate to him to hold them in. It was this plate that eventually killed him. Refusing to divulge any information he was racked and the result was that the plate cut into the hernia and ruptured it causing him to bleed to death in his cell in the early hours of 2nd March 1606. He took his knowledge of his priest holes to the grave, having divulged nothing to his torturers. The official stance was that he had committed suicide by ripping himself open with the knife given him to eat his meat. 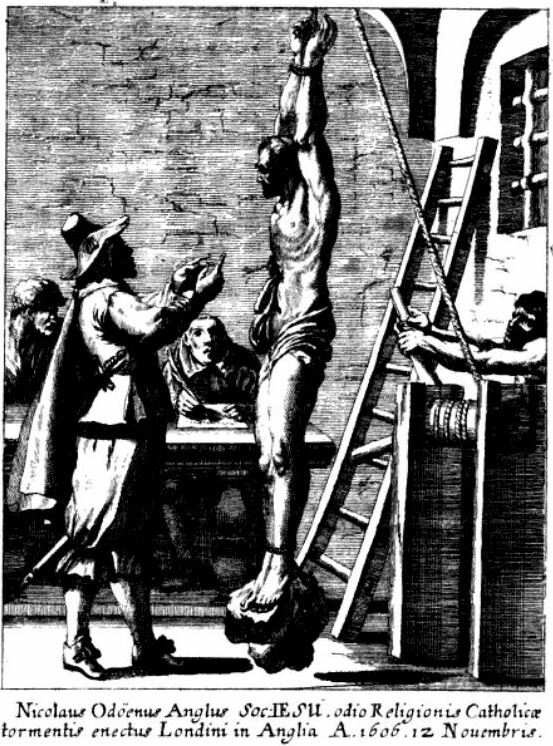 It is an unlikely story as the torture had left him unable to use his hands at all and suicide, for a Catholic, was a mortal sin that would have endangered his soul. He was buried in the Tower. Father Gerard said of him ‘I verily think no man can be said to have done more good of all those who laboured in the English vineyard. He was the immediate occasion of saving the lives of many hundreds of persons, both ecclesiastical and secular.’ It is true that many priests must have owed him their lives and many Catholic families were able to receive the sacraments from a priest because of his work. So next time you are visiting a Tudor house and you are shown a priest hole, spare a thought for Nicholas Owen − for his ingenious work and for his horrific and painful death at the hands of the English government. Harvington Hall in Worcestershire has four priest holes attributed to Nicholas Owen. There is a Roman Catholic Church dedicated to Saint Nicholas Owen in Little Thornton, Lancashire. He was beatified by Pope Pius XI on 15 December 1929 and canonized by Paul VI on 25 October 1970. His saint’s day is 22nd March. Priest holes at Hoghton Tower and at Rufford Old Hall feature in my novel Many Kinds of Silence. Next The Queen, the Duke of Lancaster!